I wasn’t entirely sure how to make this announcement. I have been thinking, does anyone really care the third time around? But with a fairly serious scare on the eve of being on the right side of ‘safe’ this week, I realised that I care!! I am not just adding a third child to our family. I view this child with the same reverence as I viewed my first and then my second just 13 months later. 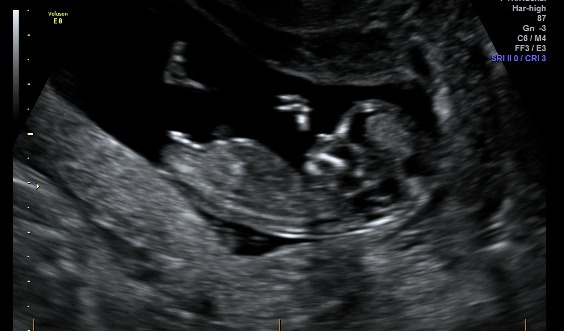 My excitement and anticipation is equal to what I felt when I discovered I was pregnant with my first. I wonder what gifts he (yes, I have boy vibes for this baby, but of course, will be happy either way) will bring to the world and I can’t wait to watch him grow from birth, confident in his amazing capabilities. So, I am super excited to announce that in a little under six months our family is going to swell with the addition of this little (affectionately nicknamed by Miss 5) Possum. It’s been a long break between babies and I have, of course, been reminded of the wonderful realities of nappy changes, sleepless nights and the fact that the children in our house will out-number the adults, but I am ready for this. Actually, I am looking forward to it for so many reasons but here are 8 reasons I am looking forward to a third baby. I am looking forward to being able to raise another child with respect. This means a lot to me as I firmly believe that raising my children with respect is my gift not just to the child but to the world. I am confident that children raised in this way will spread this love throughout their lives through their own respectful treatment of those around them. I am looking forward to seeing this baby through RIE eyes from the beginning. It is a blessing to be able to use my new found understanding of the RIE philosophies to meet and greet this child with true respect and acceptance from day one. I can’t wait to spend time with Possum at the change table, slowing down and developing our relationship, learning more about him. Our time spent together will be special and will give us both a chance to take time out to listen to each other and enjoy each other’s company. I look forward to the emotions he is going to feel completely comfortable expressing in my presence. I love that I will be able to give him that gift of validation of these emotions so that he will know that he is being heard and that it is okay to feel. I can’t wait to watch him reach his milestones in his own time frame. I know that the confidence this will give him as he is trusted to add skills to his repertoire without expectation or assistance will set him up for a life time of self-assuredness. I look forward to seeing the interactions between my eldest children and their newest sibling. I wonder what the dynamic will be like but also fully accept that whatever that transpires to be will be exactly what it needs to be for them to learn about each other and develop their own relationship over the years. I can’t wait to connect with this baby over meal times, bath times and other care giving moments. I know that it will be in these precious moments that we come to know each other deeply and fill each other with our mutual love and attention. I can’t wait to spend time observing him at play/work. Watching him explore the miracle of his body before he begins glimpsing further into the world around him. I am already running ideas through my head about how to make a little ‘yes’ space for Possum to be able to feel safe to explore and grow with confidence and independence. I know this will be vital as, with two other children, there will be times that I will not only need to get things done but the baby will need a space that he can call his own without his well-meaning siblings going slightly overboard with their affection. This time around, having a deep understanding of Magda Gerber’s RIE philosophy, I feel I am entering this parenting gig fully equipped with everything I need to be a good Mum. I have confidence and even look forward to the challenges that being a parent of three will bring our family. I know that I now have an abundance of acceptance that will allow me to follow my mentor, Janet Lansbury’s, advice to “let feelings be” and remain “unruffled” during the testing times. I feel as though my CEO suit is washed, ironed and at the ready for me to call on when needed but I also have my crumpled, unwashed playsuit proudly hanging right by it for my child to learn about my fun side when I am compelled to authentically do so. I am committed to respect this child (as I do my other children) and to bring him up to be who he is, within my loving bounds. I am under no disillusionment that life will be easy. I recognise that there are challenges ahead that I can’t possibly even predict but I know I am strong and I know that I will be able to work through these challenges with the love and support of those around me. As I come out of the haze of the first trimester, I hope to be able to share more of my journey with you all as well as to post more anecdotes from our never-dull family life. This entry was posted in Parenting Peacefully and tagged Respectful Parenting, RIE, Third Baby on May 2, 2016 by peacefulparentsconfidentkids. Oh to have a new bubba in the house again…. Oh, I know! It’s going to be wonderful!!! ? Congrats!! We are in the exact same boat! 3rd bubba on the way (12 weeks) first 2 were very close and a bigger break this time and I’m now a peaceful parent (well trying). Congrats! Oh, wow, that’s amazing, Amy! I’m so happy to have a parent twin!! Congratulations to you, too! Congratulations! I look forward to reading about your journey with your third. Congratulations! That’s wonderful news. My second baby is 10 weeks old, and although I knew about RIE with my first, there is still so much I didn’t fully understand. I feel so much less anxious this time around.